Pamper your skin with Genuine Virgin Aloe TriDerma Extreme Dryness Plus Cream 2.2oz, model #56025. TriDerma is a line of true skin care products made with Certified Genuine Virgin Organic Aloe, moisturizers, and other carefully selected botanicals to target and help heal a wide variety of skin problems. 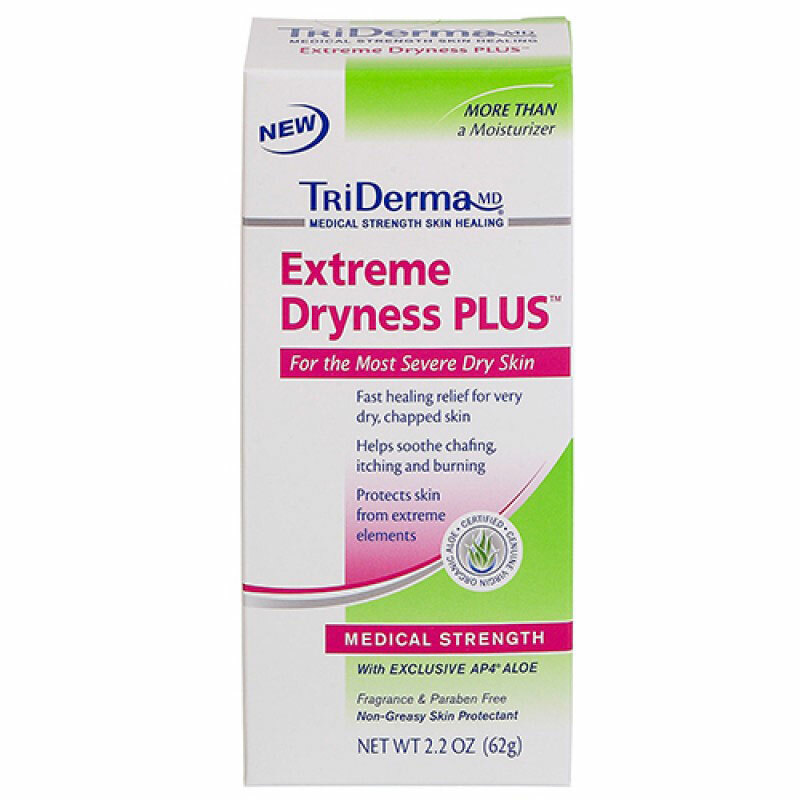 The Genuine Virgin Aloe TriDerma Extreme Dryness Plus Cream 2.2oz is more than a moisturizer. It delivers intense moisture to very dry, chapped, chafed or cracked skin. This unique formula contains clinically proven, medical strength ingredients to help lock in vital moisture and reinforce skin's natural protective barrier. It helps sooth itching or burning and helps keep skin protected from extreme elements. This concentrated mega-moisturizing cream helps repair extremely dry, damaged skin without being greasy. It quickly absorbs into your skin leaving it feeling silky soft. It provides natural skin protection against air conditioning, heaters or extreme outdoor conditions. Safe to use head to toe for soft, smooth and hydrated skin all day long. A customer favorite for Crepey Skin. Helps prevent and temporarily protect chafted, chapped or cracked skin. Aloe Barbadensis (AP4 Genuine Virgin Organic Aloe Vera) Leaf Extract, Urea, Glycyrrhiza Glabra (Licorice) Extract, Cetyl Alcohol, Cetearyl Alcohol, Zinc PCA, Petrolatum, Tocopherol Acetate (Vitamin E), Squalane, Sodium PCA, Beeswax, Panthenol (Pro Vitamin B5), Retinyl Palmitate (Vitamin A), Cholecalciferol (Vitamin D3), Polysorbate 60, Triethanolamine, Phenoxyethanol, IPBC, Disodium EDTA.